Like the Canadian rapper himself, the stage production for Drake’s Club Paradise Tour is bold, strong and masculine with a commanding presence. The focal point of the set is an industrial-looking backdrop, made up of 40 6’x6’2’ alloy frames, each harboring a number of integrated lighting and video elements, which serves as a fitting marquee for the actor-turned-singer, who burst out as Billboard’s “Top New Hip Hop/R&B Artist” in 2009. It took an artful balancing act to turn this cutting-edge trove of technology into a stunning visual concept that, at the same time, wouldn’t overpower Drake and the hip-hop power players who perform with him on the club-themed tour, now entering its second U.S. leg. Among the individuals credited with walking this fine line are the tour’s creative director Willo Perron and lighting designer Patrick Dierson. From both a design and functional perspective, the self-contained alloy frames – called “Paracubes” by the creative/production staff -- were key, said Dierson. 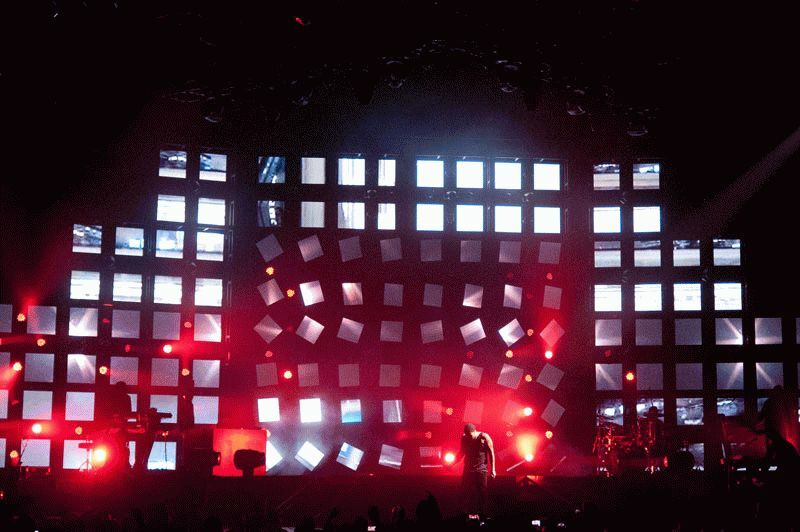 Each cube is pre-rigged with its lighting and video contents, so that the units can be set up almost “modularly,” saving considerable loading time. Aesthetic-wise, the diverse elements in each Paracube allow for the creation of some very different and unique looks. A real standout on this count has been Elation Professional’s EPV762 MH Moving Head LED Video Panel, which is mounted at a 90° angle, yoked out and spaced congruently with other video products within each cube. A 7.62mm-pixel-pitch 19.2” square panel containing 3-in-1 RGB SMD LEDs, the EPV762 MH is capable of panning a full 540° and tilting 265° like a moving head light fixture. The innovative Elation panel was “an integral part of our design and we really wanted to see what they could do,” said Dierson, who used 48 EPV762 MH units on the first leg of the tour. In addition to serving as moving video displays, the idea was that the articulating panels could be used without video as moving surfaces to reflect other light sources.